音研本（中國藝術研究院音樂研究所藏本）Music Research Volume, in the collection of what was then called the Music Research Bureau of the Chinese Arts Research Institute. 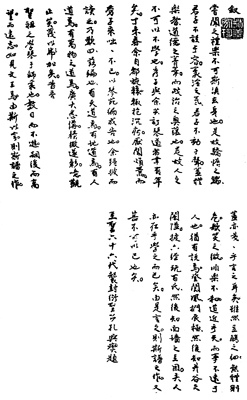 Of these the Yu (Chongqing) Volume ("main edition") was the most complete, so it was printed as is in QQJC (XI 211-460). To this (461-527) is then added an appendix with parts they had that were not in the main edition. The result is that the main edition has 78 melodies, but the appendix then has 27 additional melodies from the four other editions. Of these, 20 appear in the main edition, thus adding seven additional titles to give the handbook 85 different melody titles in all. It shoudl be noted, though, that some of the 20 repeated titles have tablatures quite different from those in the main section. Although these three titles appear here first, they may actually have once been included in earlier handbooks that are now lost. 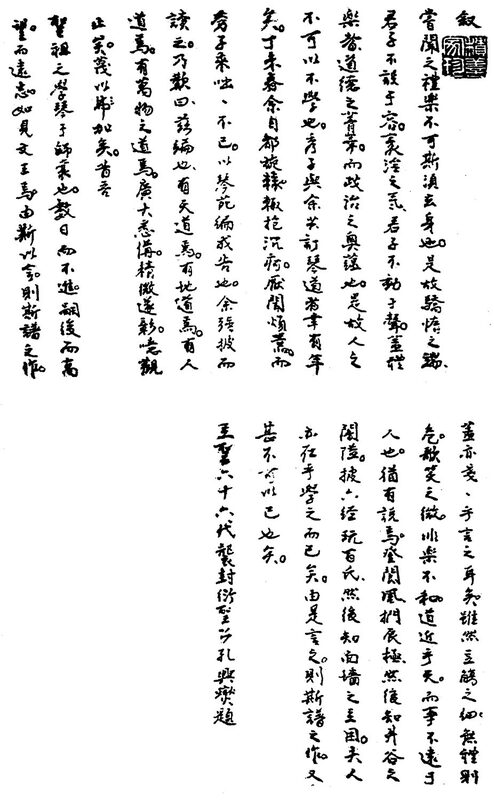 The general attribution of this work is to 孔興誘 Kong Xingyou of Shandong; this is the name as written in Qinshi Xu, Qinshu Cunmu and in various places in the handbook (see image with the Table of Contents). Zha adds that Kong and his group collected many old melodies. The differing versions of some melodies, mentioned above, points to the complexity of the task they had undertaken. The wide differences between the same piece as copied in two editions, plus this comment on how it apparently copied Shen Qi Mi Pu melodies, both suggest that differences come from using different editions rather than from editing the ones they found. The work is said to have begun in 1637 and continued until 1668. Zha's commentary says that at first this work had a different title, 琴苑大雅全編 Qinyuan Daya Quanbian. Later it was quite well-known and highly respected, often referred to simply as 琴苑 Qin Yuan. Seventeen of its versions were included in Tianwen Ge Qinpu. The QQJC edition was compiled from various sources.